Cute, cool and carefree, Elle Fanning is living a teenage dream. She talks puff-ball dresses and fancy cheese with Indigo Clarke. LULA: What drew you to the film world, and acting in particular? 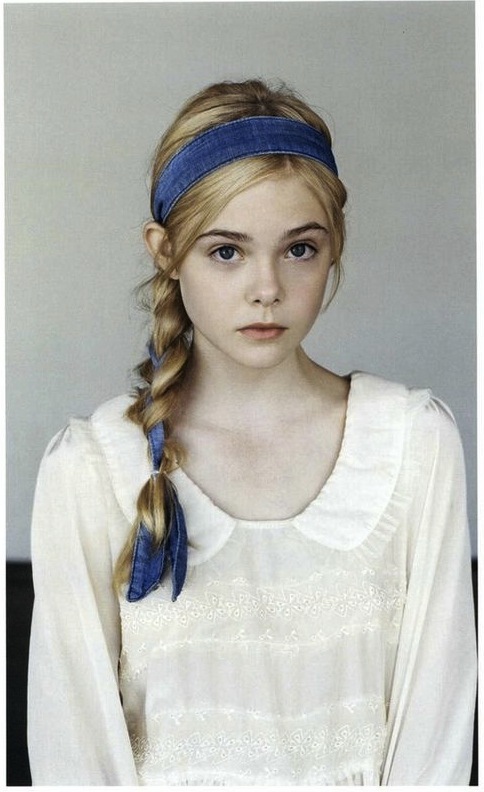 Elle Fanning: Well, my sister, Dakota, had started acting before me and I saw her having lots of fun and thought it seemed like something I would enjoy, so I wanted to have a try. My first role was in I Am Sam, where I played my sister’s character as a younger girl. LULA: How do you prepare for a role? Did you learn a lot about tourette’s syndrome before your role in Phoebe in Wonderland? LULA: What is your relationship like with your sister Dakota - does she help you with acting? Elle: Dakota definitely really inspires me. We don’t really talk about movies and things like that you know, but we hang out a lot and have fun together. She’s actually here right now while I’m talking to you on the phone! LULA: Do you and Dakota have favourite places to hang out together? Elle: Yes! We love to go to the The Artisan Cheese Gallery, it’s our favourite place. There are these amazing salads and sandwiches there – my favourite is the Cobb Salad, I could eat it every single day. LULA: You are starring in Sofia Coppola's 'Somewhere', how did that come about? Elle: Sofia called me one day and wanted to meet up. We went out bowling, which was so fun, and then looked around the Chateau Marmont – because most of the film is set there. Sofia is amazing, and I loved the script so much. The moment I met her I really wanted to be a part of the film. The character I play is so natural – she is a normal 12 year old girl who is sad that her parents are divorced, she is living with her dad and they are reconnecting. LULA: What was Sofia's directing style like? Elle: Sofia was so wonderful to work with. She is just so calm and really gentle – she can get her ideas and direction across in such a gentle way. She feels like a big sister to me now, we still talk all the time, it’s so nice. LULA: Did you have to do much improvisation on set? Elle: Everything was pretty much scripted, but some of the scenes in the Chateau Marmont we had to improvise – Sofia was really open to that, which I was really happy about. LULA: Do you have a favourite movie? Elle: The Devil Wears Prada is the go-to movie for me and my friends for sure. I also love the Seven Year Itch. I really love Marilyn Monroe. I have a Marilyn Monroe App on my phone that gives me all kinds of information on her, and I have framed pictures of her in my room. LULA: What do you love to do on weekends? LULA: As a young style icon in the making, what does fashion mean to you? Any favourite designers, or pieces you love? Elle: I love vintage clothes the most. I try to mix vintage with simple items like jeans and boots – like wearing frilly dresses or shirts with boyish shoes or old jeans. I have 1950s reading glasses that I love. They are that sort of cat-eye shape, and an odd orange colour – they are unusual but I love them. I don’t really care about labels that much yet, I just wear the things I like. Actually, most of the things I wear don’t even have labels because they’re so old! LULA: What would your dream dress look like? Elle: My dream dress would pouf out at the waist, probably with a 1950s style Peter Pan collar. I love puffy dresses that have a small waist and then pouf out – that’s why I love vintage because so many of the 50s dresses are like that. But, the women then were so tiny, and I’m on the taller side. At school, we can wear any white shirt with a collar, so right now I’m trying to find one with a Peter Pan collar to wear. LULA: So you go to a regular school, but you also have a tutor on set? Elle: Yes I go to a great school that is really cool in that they let me go off and make films, and then come back when the shooting is finished. They set me the same schoolwork as the other kids, and I do it with my tutor while I’m on set, so I’m not missing out on what all my friends are learning. LULA: What are your favourite subjects? Elle: I love all the artsy type subjects – but I also love science. My favourites are definitely creative writing and art. LULA: Do you have any actors you particularly admire? Elle: My sister for sure! I love all of her films, I really loved Charlotte’s Web. At the moment, when it comes to actors, I kind of look up to everyone, because they are older than me and have more experience. I really admire Marilyn Monroe as well. LULA: What about favourite director’s? Elle: Sofia [Coppola] because she’s a woman, and because she’s just amazing. She still really keeps in touch with me a lot. When you leave a movie set you think it’s all over and you’ll never see all those people you worked with again – so it’s great to maintain the relationship I have with Sofia. LULA: Rodarte chose you to be part of this issue of Lula. Did you already know their work? LULA: Had you already seen Lula before doing the shoot? Elle: The shoot was the first time I’d seen Lula. I love it and would totally buy it! LULA: If you could be in the film version of any book, which would it be? Elle: Definitely ‘A Wrinkle in Time’. I read that a couple of years ago and I’d love that to be made into a movie. It’s just so different, it is such an interesting story. It's about kids going into another world, where everything at first seems the same but is actually quite different. LULA: What do you dream of doing when you grow up? Elle: Whatever I do, I hope I can still be an actress. I’d also love to be a model – I love doing photo shoots. I would love to be a Ballerina as well! My dream would be to go to Paris and dance there… I’ve never been to Paris and I can’t wait to go. I’m learning French in school right now. LULA: Have you seen a ballet you really loved? Elle: I went to my first ballet recently, it was Sleeping Beauty. I loved it so much, it was so magical, it made me want to try harder to become a ballerina. LULA: If you could be Queen of the World for one day what would you do? Elle: Oh that is so hard to answer because there is so much I could do! First, I’d try to help all of the people in need however I could, then I would make sure to do whatever I could for my family, after doing what I could to make everyone happy I would go to the Artisan Cheese Gallery and eat a Cobb Salad (laughs). LULA: Haha! What makes where you live special? Elle: I live in LA in Studio City, I’ve lived here so long, though I was born in Georgia. I feel so safe here, it’s really pretty and everything is easy to get to – and it’s special because from our house we can see the 4th of July fireworks. LULA: What do you get most excited about? Elle: My birthday. I love birthdays. I love surprises. My eighth birthday I wnt ice-skating, that was really fun. The next birthday for me will be my 13th – I’ll probably go somewhere special. For Dakota’s we went to Las Vegas and saw Cirque du Soleil and stayed overnight in hotel. Elle: I am scared of elevators! Elle: (Laughs) Because you’re in this little space that’s moving up and down – anything could happen, it could just drop! I’ve been stuck in one before so maybe that’s why… I’d rather take the stairs. LULA: When are you the happiest? Elle: When I’m on a movie set I always feel really happy. It’s like my second home. Lula: What do you wish for? Elle: I wish for the future that I will love whatever I end up doing. I love to sing, dance, act, model – so, I hope when I get older I get to do at least one of these things.